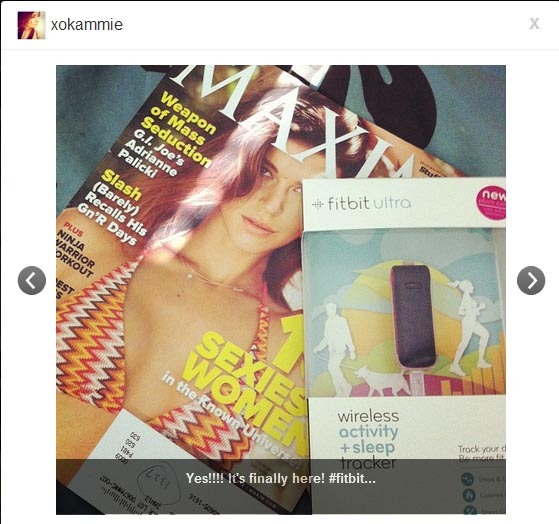 Besides the new Maxim, I was super excited because I finally got the FitBit Ultra! I sold some college books back and I thought the price (after the Amazon sellback money I got) was enough for me to pay to get it. I was super excited. I’ll have a fuller report on it once I use it longer, cause I’ve only been using it two days so far. But wow, is this little gadget motivating?! Seriously. Yesterday was a marvelous day because I was the most active and healthiest I’ve ever been. I’m sure FitBit was a helpful thing because it really made me realize how little I actually move throughout the day. Working out in the morning isn’t enough and I should try to keep active all throughout the day. It motivated me to really look at myself and improve in terms of how much I move! I did my weight training workout in the morning upon waking up (Chalean Extreme Lean Circuit 3) which included a lot of chest and legs. I pushed hard! I didn’t wear my fitbit for this workout though. I figured it wouldn’t really measure much since the fitbit measures steps and weight training isn’t really focused on “stepping”. Then later, I decided to dust off the Xbox Kinect and play My Shape: Fitness Evolved 2012. This game is so awesome, I totally forgot about it. I did a 15 minute boxing workout, played some jump rope survival, and a stepping game. It was really fun and before I knew it, 45 minutes went by and I was dripping sweat. Great workout and so much fun! My calves were killing me from all the jump roping, I wasn’t used to so much jumping. Unfortunately, my knees were a little upset but thankfully not enough to think it’s a big deal or anything. As a reward, I woke up today and weighed myself only to find the smallest number on the scale I’ve seen in one and a half years!! I know it’ll go back up once I eat more “normal” again but wow, that really made me feel amazing about myself! Now it’s your turn, tell me something marvelous about your weekend! Ok I so want one of those, some girl had one at BLEND and she loved it, she had to make sure to get her steps in, haha! Ah, how fun you’re doing a post about the fitbit tracker. The editorial office (a running magazine) I intern at got one to try and they gave it to me. While the editor who had to write about it (and pretty much the rest of the staff, too) thought it was ridiculous I’ve been wearing it ever since. I think it’s so motivating!